Melbourne's largest park is also one of its most generous with plenty to do. 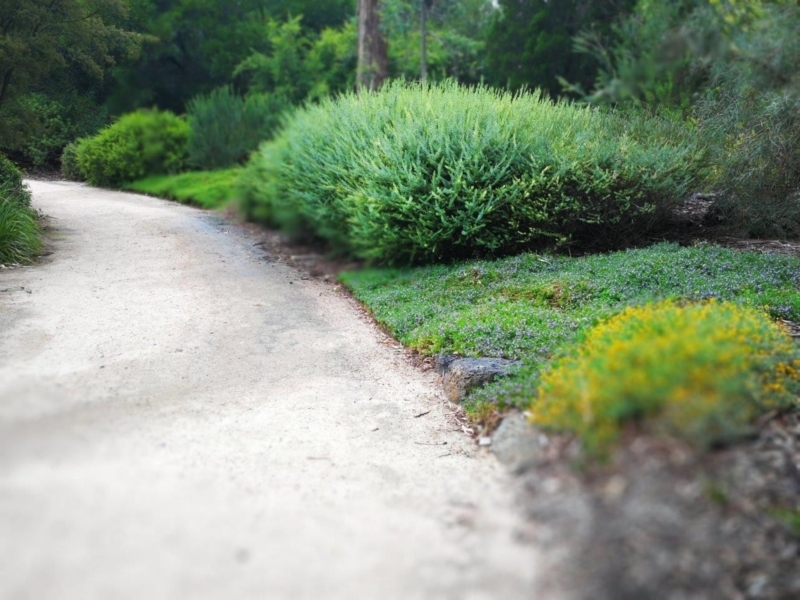 This walk takes you to the native grassland circle, the inspiring Nature Play space, the Australian garden and more. Let's be honest. 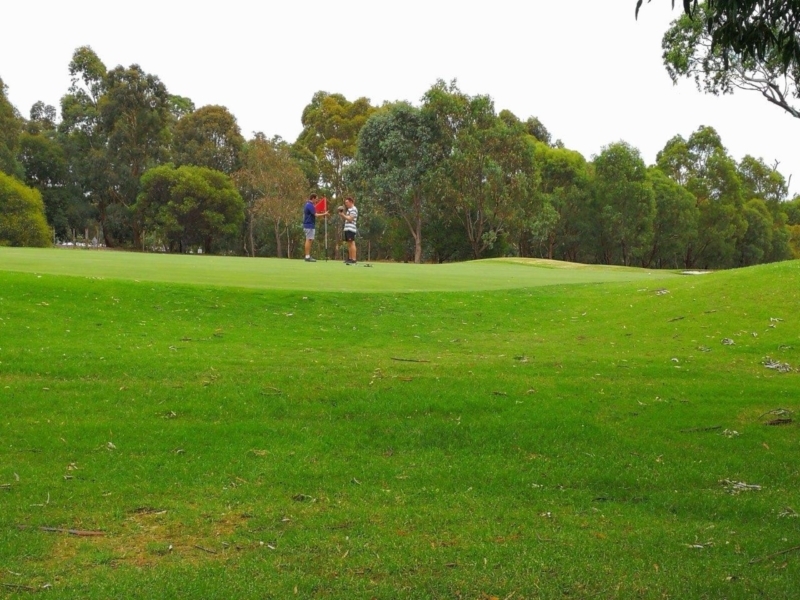 Royal Park, though Melbourne's largest at 200 hectares, has its detractors. Some argue the vast, mainly native parkland is haphazard and that its many spaces lack composure or a sense of overall "place". But I love Royal Park. 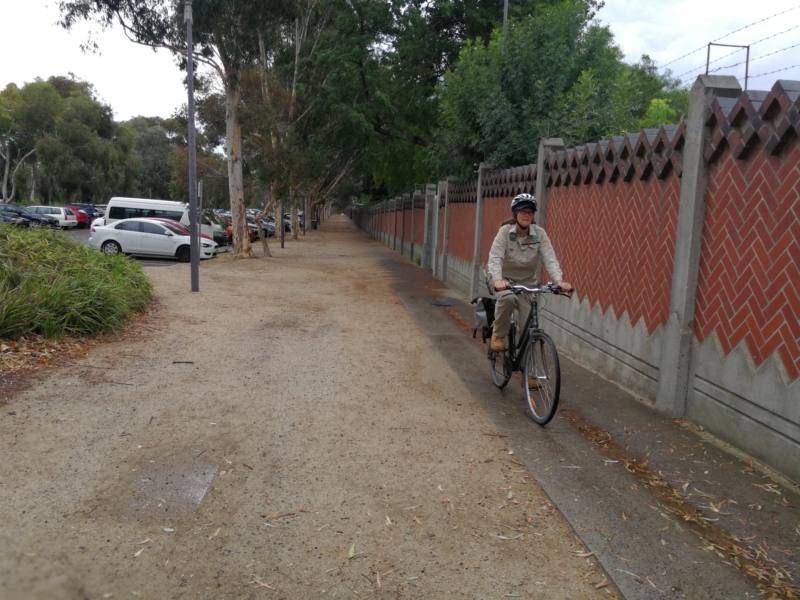 I love that you can wander for hours in vast areas of almost scrubby bush land, and completely forget how close you are to Melbourne's thriving centre. Dog owners will love the leash-free areas surrounding the native grassland circle in the park's heart. The circle itself is a great place to lie down, stare up at the sky and contemplate life. 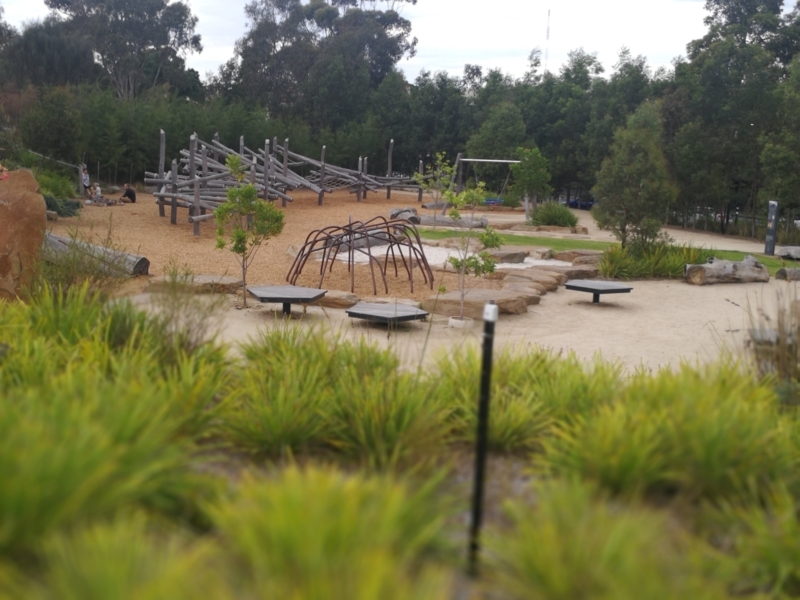 Plant-lovers can appreciate all these aspects; the Nature Play space abuts a beautiful garden based on the Wurundjeri's seven seasons while the 1970s-established Australian Native Garden further north (the Gatehouse Street side) offers up red gums and a collection of plants gathered from the whole continent. 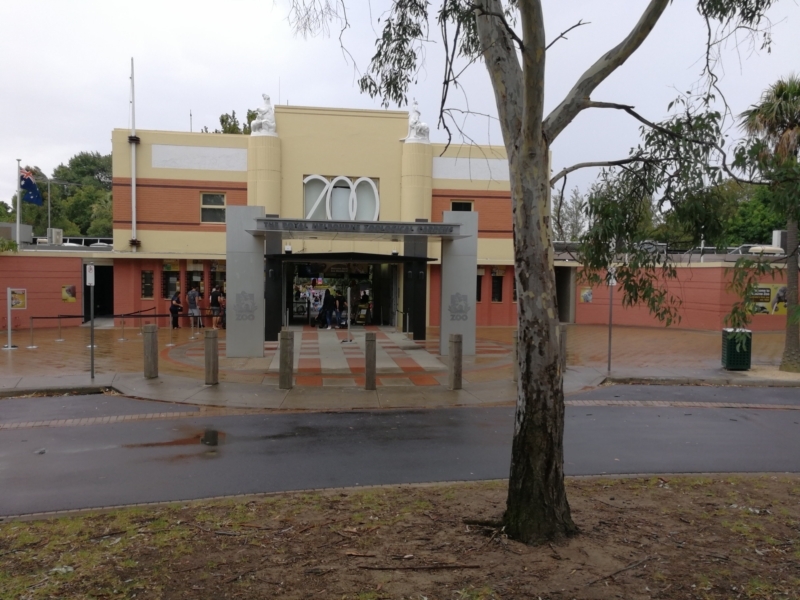 History buffs will definitely want to stop at the Burke and Wills memorial on MacArthur Rd. If you have more time you may want to explore the Billabong area (not included on this route, and off-limits to dogs). There's so much to see and so much land you will need a good half-day to exploring Royal Park. 1. 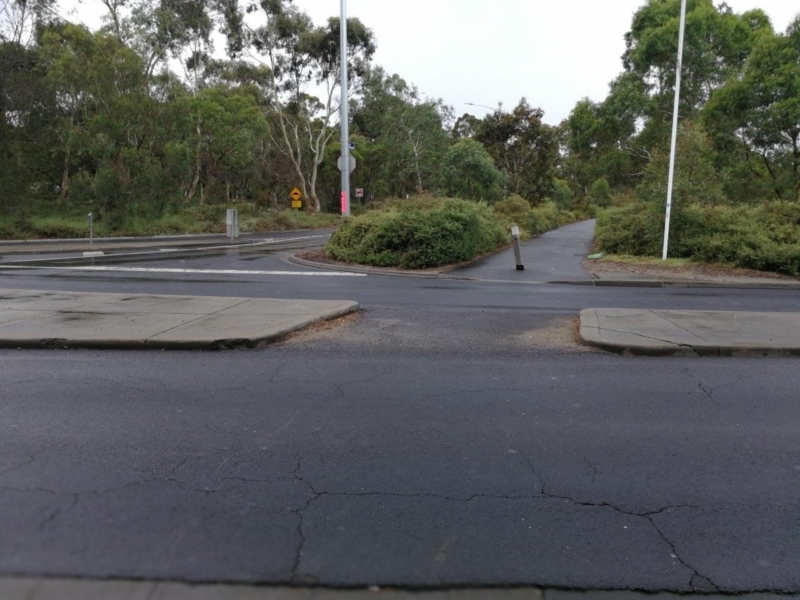 Melbourne's most generous park? If you've never really taken the time to explore Royal Park, put it on your bucket list. It's huge! 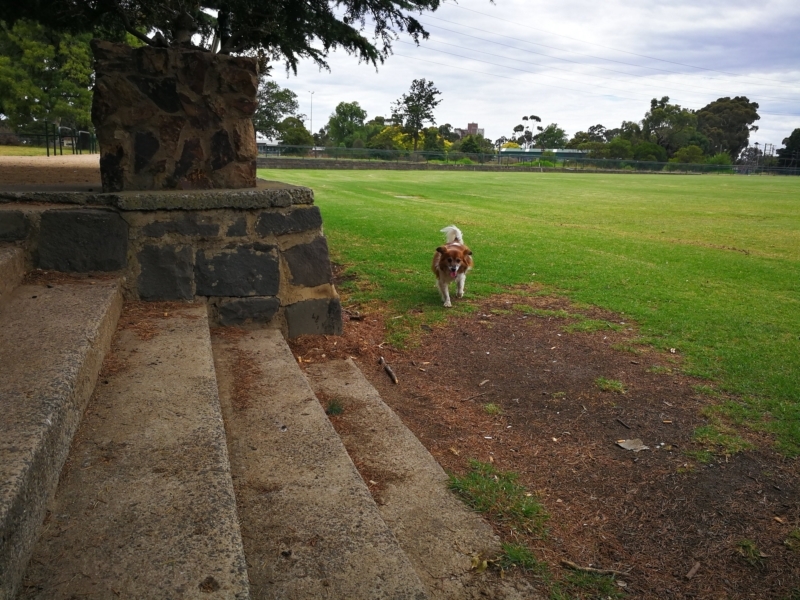 This lovely old sports oval is a leash-free area for dogs, provided no soccer or football games are taking place! 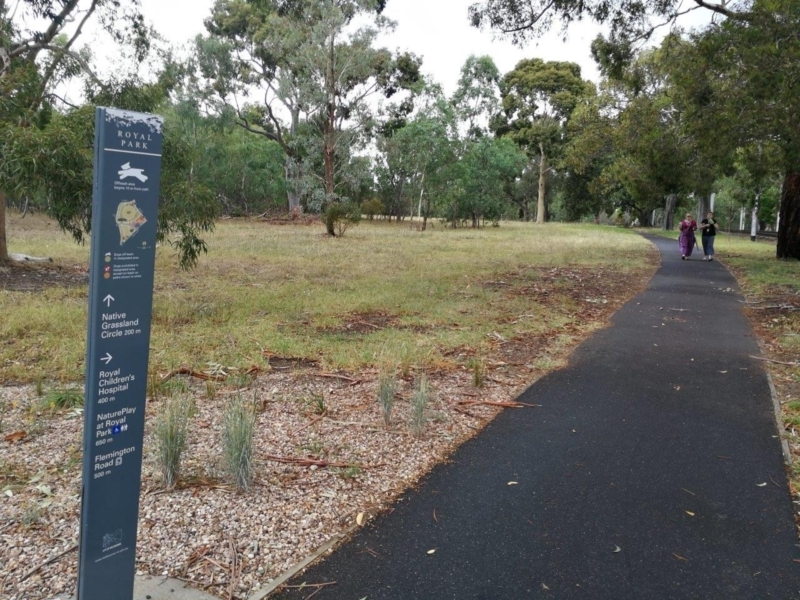 Note that some areas of Royal Park are strictly off-limits to dogs (see link). If you fancy some time with the animals as part of your day out then you'll find one of two main entries here. The train station is very close (an alternative place to start this walk). 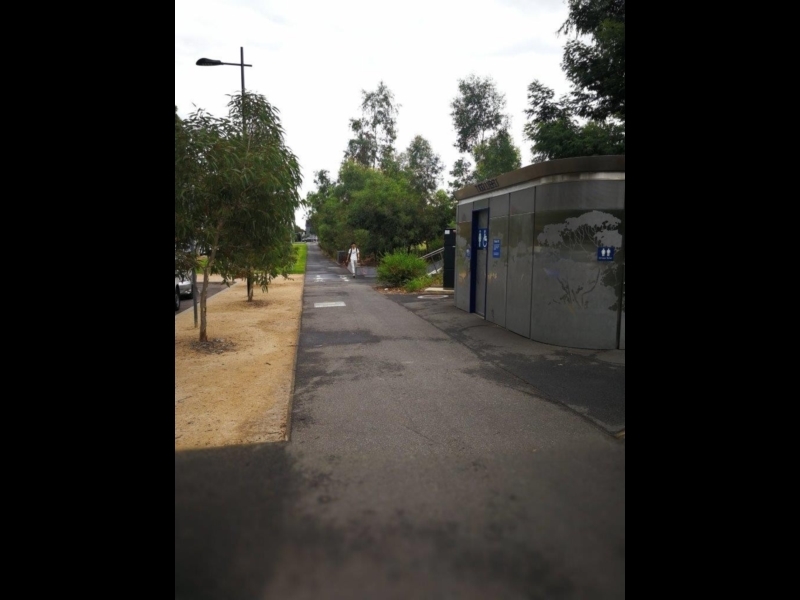 To get down into the main areas of Royal Park you'll need to get past the zoo. Head along the north-east perimeter wall of the zoo and depending on the time of day you may hear the residents! 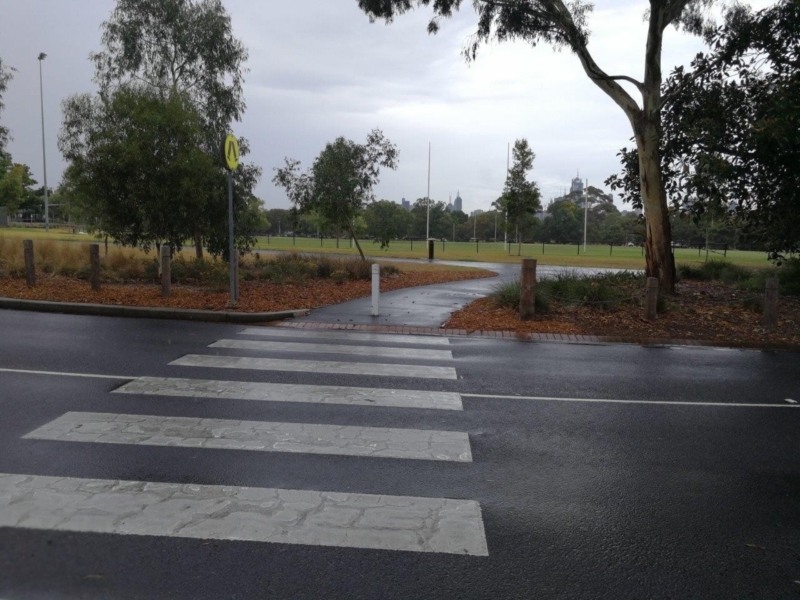 Now that you've made your way to the southern end of the zoo, use the pedestrian crossing to make your way over to the shared path near Walker Oval. Take care crossing MacArthur Road as there are no lights here. But once you're safely over you can really begin enjoying some of the lovely native landscape Royal Park has to offer. 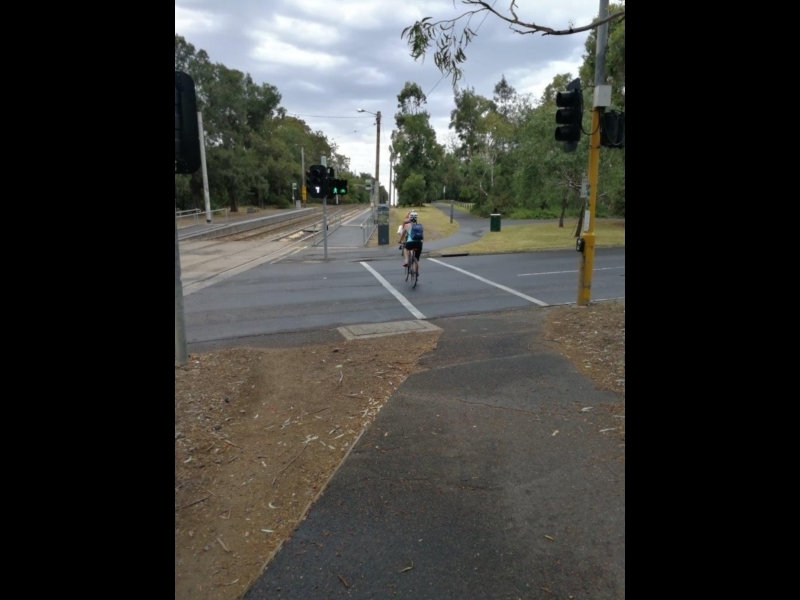 This intersection is a tram stop on the 55 tram route to the city and there are lights for pedestrians and cyclists to cross from the tram stop to south side of the park. This is a popular area for walkers taking a break from nearby work places. 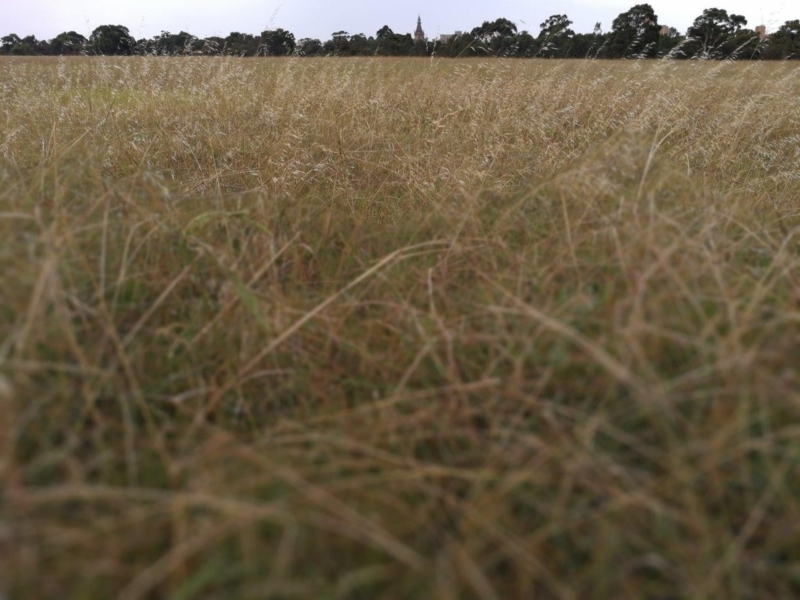 Royal Park has its detractors and the grassland circle epitomises the unease some feel here. But you may find you are one of those who love the sprawling, vast space and the whispering native grasses. No matter what age you are, you must roll down the grassy hill en route to the Nature Play space (in background of photo)! 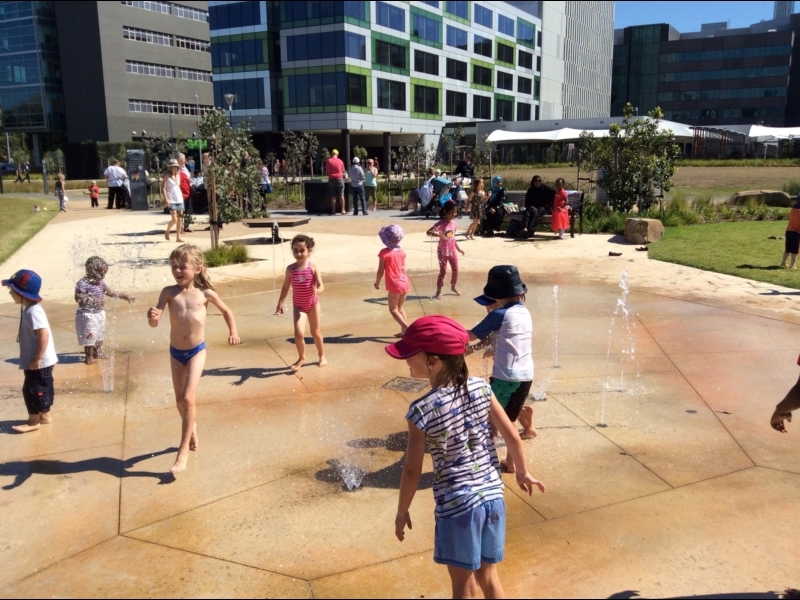 There's nowhere better to be for little ones (and their parents) than splashing about in this cool water feature - part of the larger Nature Play space, so pack some spare clothes if it's a hot day! 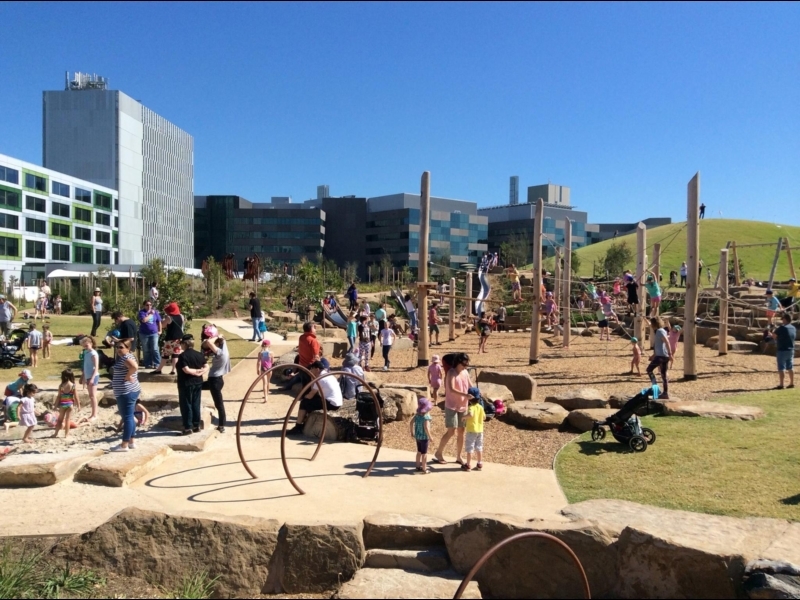 This much-loved contemporary playground was designed to encourage modern kids to take risks. Its popularity has thankfully inspired many other playground-designers and local councils to do the same! Some modern facilities for those who need to take a break so that they can continue playing, climbing and getting wet! Designed by landscape architect Grace Fraser in 1977, this garden is more formal than many modern native gardens and features plants from all over Australia. Beautiful and peaceful. 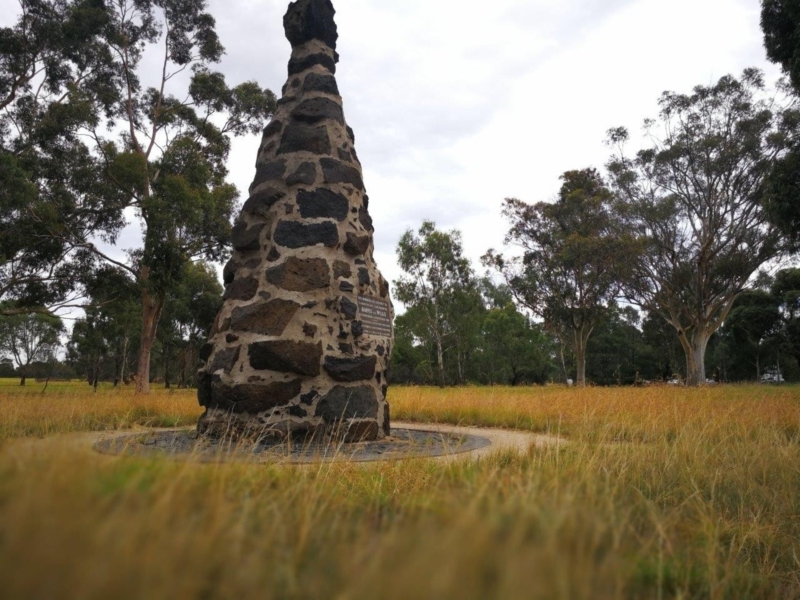 This stone cairn marks the departure point for the explorers' successful but ultimately ill-fated expedition. The expedition party left from this spot in August 1860. 16. Fore! Beware of golfers! You may want to take a little care as you wander north here - as there may be the occasional errant golf ball to contend with!